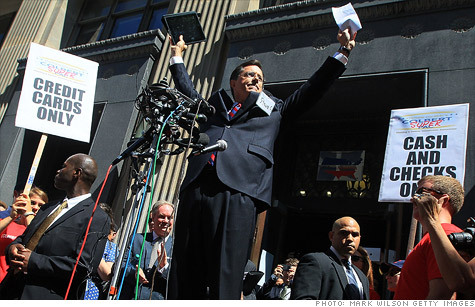 Stephen Colbert after the FEC ruled he was eligible to create a super PAC. NEW YORK (CNNMoney) -- In late March, Stephen Colbert expanded his super PAC experiment, admonishing his late-night viewers to start organizations of their own on college campuses across America. They listened, and now the Federal Election Commission's roster of approved super PACs is filled with groups registered to addresses in college towns. Danny Ben-David, a freshman at MIT, was one of the first to get in on the craze, after winning approval for his Why Not ZoidPAC? in March. "I was just sitting in my dorm room one night and said 'oh hell, why not?' It was almost frustratingly easy," Ben-David said. The physics major said the whole process took just a few hours, and that the trickiest part was opening a bank account to accept funds, an FEC requirement. "It cost no more than a 44 cent stamp and 5 pieces of paper," said Ben-David, who according to FEC documents is the president and grand poobah of the super PAC. "Although I did call the FEC to make sure the question mark was okay," he added. Can 46 rich dudes buy an election? As the president of ZoidPAC?, Ben-David now has the ability to accept unlimited sums of money from corporations, unions, associations and individuals. And just like the professional political operatives who run most super PACs, he can spend unlimited sums to overtly advocate for or against political candidates. He's not the only college kid with this power. For much of the past year, Colbert has been using his show on Comedy Central to poke fun at the Supreme Court's Citizens United decision, which eventually led to the creation of super PACs. Colbert has a super PAC of his own called Americans for a Better Tomorrow, Tomorrow. The comedian has solicited donations, spent money on campaign ads and illustrated just how easy it is for corporations to route money to super PACs while remaining anonymous. To help nudge students down the road to super PAC ownership, Colbert sold 1,000 "do-it-yourself super PAC kits," to viewers in recent months. "The kits provide students everything young people need to form their own super PACs," Colbert said in a press release. "Federal Election Commission paperwork, filing instructions, an allen wrench, and a small canned ham that resembles Karl Rove." One of those kits went to David Jensen, a 24-year old professional baseball player from California who was recently released by the Los Angeles Dodgers. "I don't know why, but I said 'I'm going to do this today,' " Jensen said. "I read the manual, and that took 5 minutes. Then I set up a bank account and I filed the thing." Jensen created Cats For A Better Tomorrow, Tomorrow, and already has a website and Twitter account set up. At last count, the website featured no fewer than 28 cat photos. Jensen has a few unique ideas that he hopes will attract donors. One is to put a donor's name on a baseball card with a cat-related pun. "The top donors would be fat cats," Jensen said. "And if you weren't donating a lot of money, you would be a skinny cat. I'd have all these kinds of cats." In Durham, North Carolina, political science major Stefani Jones created a super PAC called Americans For A Better Tomorrow, Yesterday, with two classmates. The trio used it as a class project for a Duke course that examines political gridlock. They got a C+. Jones said the low grade had something to do with incorrectly citing sources. Still, the group came away from the project with a fully-functioning super PAC. "We figured that if Stephen Colbert can do it, a group of college students can do it too," Jones said. Jones, who recently changed her official position at the super PAC from treasurer to Coordinator for Non-Coordination, said the super PAC will be setting up a lemonade stand at Duke to collect donations. What will the money be used for? Supporting candidates who are interested in time travel research, of course. Yet underneath all the jokes, there is an undercurrent of seriousness shared by the Colbert-inspired super PAC owners. "I find it amazing that anyone can do this," Ben-David said. "It's ridiculous. The whole system is really rather sad and degrading to the political process." And Jones said she is concerned about the "insane amounts of money to flow into the political system." "We see all the political gridlock in Washington," Jones said. "It's easy to see how money contributes to the gridlock."